Tessa Rodriguez works at a video game company and is dying to be promoted to engineer, but she isn't taken seriously enough. When she meets a group of sisters who are worried about losing their bookstore (and home), she decides to create a video game to enter in a contest for them. She has only three weeks to do it, but she enlists the help of her roommate and co-worker Adam and some of the other guys from work. The projects brings Tessa out of her introvert shell a bit and much closer to Adam, but should she risk their good roommate relationship for something more? This contemporary romance novella is everything that's right about self-publishing. Traditional publishing doesn't give us a lot of novellas, first of all, yet sometimes your book only needs to be 150 pages to tell its story. Secondly, a romance novel about a Latina woman working in the video game industry? Yes, please. This story is so obviously filling a gap, yet I don't know that a traditional publisher would see it that way. They might just view is as a risk because it's too niche. The cover art is also perfect, and captures the feeling of the story. It's cute, but not cutesy and doesn't take itself too seriously. The comic book style is totally appropriate to the story and characters. It's a welcome departure from the typical glamour and overly sensual facial expressions that grace most romance novel covers. I loved everything about Tessa: her career ambition, her hermit-like tendencies, and especially her desire to help her new friends. She went way out of her comfort zone to even meet these women, and it was great to see her form friendships with them right away. The women in this story were all unique and atypical for romance novels and I found them totally refreshing. I heard about Level Up on the DBSA podcast, which did an entire episode about this short book. They talked a lot about the world-building and how true to life it is for women working in the tech industry. Like many women in the tech industry (apparently), Tessa is in the situation of having to either be one of the guys and taken seriously, OR considered an actual woman who is datable. It was a great discussion and there was no way I wasn't going to read this afterward - it is rare that DBSA does an entire episode about one book, and their praise was too enthusiastic to ignore. Although Tessa wasn't treated as an equal, don't think the guys in this book were boneheaded jerks. I found them very true to life based on men I know who work in the tech industry. I've never worked at any kind of software company myself so I can't really speak to the work conditions, but I know these guys. They are decent people, but not terribly bright about interpersonal relationships sometimes, and their occasional off-color or slightly sexist jokes aren't mean-spirited, just....clumsy. They kind of know when they're being dicks, but are sometimes a bit helpless to stop it. There are some definite feminist messages in here, but Yardley doesn't whack you over the head with them; they are seamlessly integrated into the story. The romance, too, progresses naturally and I found it both sweet and realistic. Adam was a bit more enlightened than the other guys from work and despite his occasional missteps was super nice, considerate, and totally appealing. He is what I guess they call a beta male? He's not forceful or possessive or any of those other qualities I can't stand in many romance heroes. I can see why Tessa likes him. The book could have been a tad more polished - there was awkward wording in a couple of spots - but it didn't detract from my enjoyment of the story. 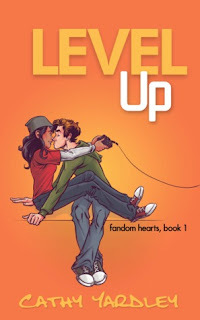 Level Up is free on Barnes & Noble and Amazon, but I hope she charges for future installments in this series. I want her to make a living at writing so she can do more of it!